The sudden and unanticipated Nickelodeon/Viacom buy-out of the Teenage Mutant Ninja Turtles franchise from Peter Laird and Mirage Studios resulted in a number of Turtle projects meeting the chopping block for legal reasons. 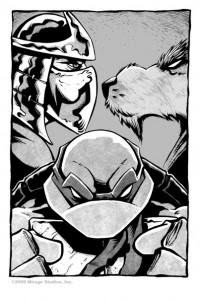 Tales of the TMNT (Vol. 2) was already on the way out even before the buy-out occurred, but other projects in the planning stages met an untimely end, such as "The Forever War", Stephen Murphy and Chris Allan’s belated conclusion to the TMNT Adventures series, or future collected volumes of Mirage’s TMNT (Vol. 1) series. The book also would have featured a flip cover by Peter Laird (Turtles on the front, Shredder on the back) and an exclusive book plate by Dan Berger for anyone who preordered the sourcebook from Panel 2 Panel. The title and the summary brought back memories of Archie’s TMNT Adventures Mutant Universe Sourcebook series, but other than those vague notions, the contents of the volume have remained a mystery. As with many titles and projects that have been axed over the years, the unobtainable quality has cursed it with a level of hype and reputation that may not accurately reflect what the tome might have actually contained. Prowl the TMNT message boards and you’ll find melancholy fans citing how the trade would have “streamlined” Mirage continuity, tying together loose ends from across volumes and canonizing guest stories once thought lost to legal issues decades ago. On the other end of the spectrum, you’ll also encounter furious fans citing how the trade would have “streamlined” Mirage continuity, eliminating entire beloved storylines that didn’t meet Peter Laird’s contemporary criteria and “butchering” the continuity of the series. As you can see, it’s difficult to gauge the actual contents and intent of the Mirage Universe Sourcebook. The project was eventually handed down to freelancer Tristan Jones, author of Tales of the TMNT’s “Gang Wars” story arc and architect of the “Monster Island” storyline. Thankfully, he took some time out of his busy schedule working on IDW’s new Ghostbusters ongoing series (available this September!) to answer some lingering questions about the Mirage Universe Sourcebook. TMNT Entity: Thanks for being willing to take the time to answer some questions about the aborted Mirage Universe Sourcebook you were contracted to work on. I dug up all the info I could online, but discovered there really wasn't a whole lot to go on. Hopefully you'll be able to clear up some of the misconceptions and mysteries about its purpose and content. I've been hoping to write this article for a while. TMNTE: Here are some questions I figured might help organize the info a bit in advance, if you could take a whack at them. Q: When Mirage approached you with the Sourcebook project, what did they describe it as and what did they initially hire you to produce? Jones: Without having access to the old email account, I can’t be 100% accurate, but it was basically a guide to the key players in the Mirage universe. I initially assumed it to be something along the lines of a Marvel Handbook, or one of those Star Wars guidecomics/books from Dark Horse. I was to consolidate the information, contribute missing articles and edit any inconsistencies so the whole thing was as factually up to scratch as it could be at the time I started looking at it (which was roughly around August or September 2009). Q: Besides character profiles, was the Sourcebook ever planned to include any other features? Jones: I don't believe so. I'd gone through to find character appearances, key issues, time line references and the like just to cover my bases and make sure everything lined up, and the extra info would be there if we needed it. Q: The widely spread online solicitation for the Sourcebook lists the creative team as Jake Black, Stephen Murphy, Jim Lawson, Michael Dooney, Eric Talbot, Dan Berger and Peter Laird (oddly, your name is absent). How much content were these other creators contributing to the project? Anything new, or were their names listed in regards to older material of theirs that the Sourcebook would be featuring (older artwork or creator-owned characters)? Jones: The book had gone through various iterations over a fairly lengthy period of time. I have a feeling most of the names listed were the ones that had been listed since the project's inception. I believe Paul Harmon's art was going to appear in the book, along with some of the other artists that followed as Tales Vol.2 went further on. I was brought in right at the end. I believe I remember Jake telling me that he hadn't really worked on the book in a number of years prior to it being handed to me, and at the time he was working on it, it was to be an online "wiki" style database. Steve Murphy and Jake had both written up a number of profiles. I can't recall off the top of my head how many, but it seemed mainly confined to characters within the first 30 issues of Tales Vol. 2, wherever Vol. 4 was up to at the time, along with Volumes 1 and 2, and even then it consisted largely of the core, recurring characters. Q: What can you tell us about the artwork for the Sourcebook? Would it have been a collection of older character art, all new pieces, a mixture of both? Black and white or color? Jones: I'm pretty certain it was a mixture of both, as I remember going through a lot of art files and finding the best panels to represent particular characters. I could be wrong, there were some fairly large scale changes made just before the deal was struck with Nick and the book had to be canceled. It was black and white, though. Q: How were you structuring the character profiles? 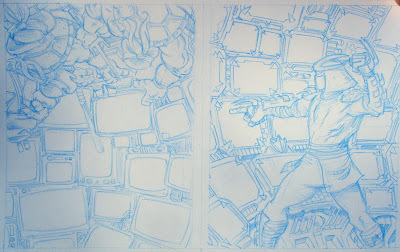 Would the layout have been reminiscent of the Archie Comics TMNT Adventures Mutant Universe Sourcebook? Jones: As I said, initially I was under the impression it would be a little more in depth than that, but the final product would have been similar to the Archie sourcebook. 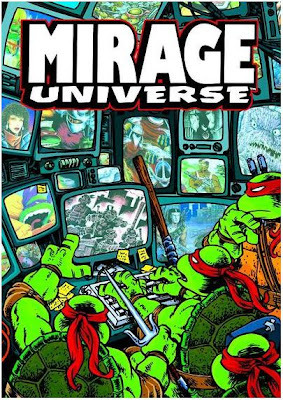 Q: Would the Sourcebook have included any characters from the Mirage TMNT Volume 1 "guest era" (issues #22 through #44); stories such as "The River", "The Violent Underground", "Men of Shadow", etc.? Jones: No, unfortunately. I remember talking to Dan about it when I was figuring out what was canonical and what wasn't and constructing a time line for the comics and I'm pretty certain anything with a vague question mark over the top of it was nixed (at least until they could get a positive answer either way, similar to Cerebus appearing in the omnibus Mirage released for the 25th anniversary). Though I believe Murphy's merfolk were in there. Q: Was there a clear intention for this project to organize or streamline continuity; clearly designating which stories Mirage considered "canon" and those they did not? Were you given a specific set of approved Mirage publications you could draw from and a list of work officially designated "non-canon"? Jones: Not at the time. Outside of the Image stuff, I went through, re-read everything, noted down every character, made annotations, worked out where everything went and then submitted a big list and then Dan made mention of the ones that definitely weren't part of it. 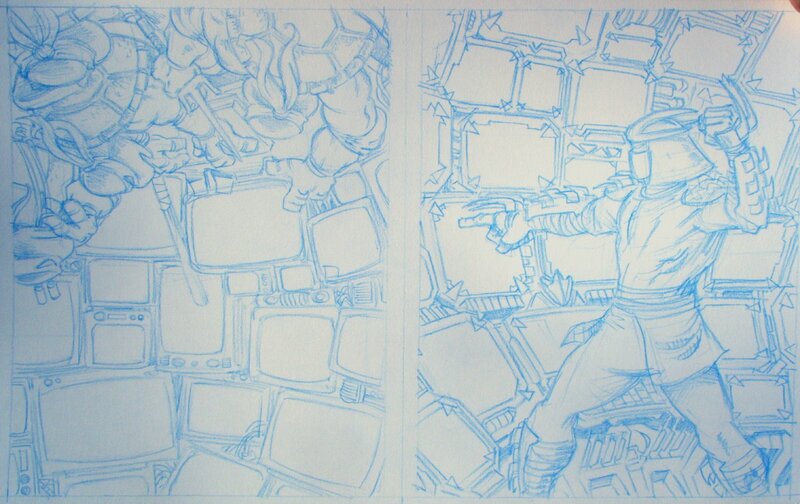 Part of this work was also in preparation for further collected editions. It was intended to be the perfect (or near enough to) Mirage TMNT universe chronology. Q: You've mentioned in passing that the project changed directions significantly while you were working on it. What changes were made to its direction or presentation? Jones: The biggest change was to do with size. The book went from being a big solid trade, to a significantly smaller book that you would flip. One end of the book would contain the antagonists, the other would contain protagonists. I can't recall exactly what the page counts were in either version, I just remember the difference being surprising. Q: Were you given any notification in advance that the Sourcebook was to be cancelled due to the Viacom buy-out? And about how much of the project had been completed by the time you heard it was cancelled? Jones: Nope. I was working on a number of ideas and even had stories approved for the script stage not long before the announcement of the sale, but because of NDA's and the relatively sudden arrival of the sale, there was nothing that could really be done or said. There was always a chance the sale wouldn't go through in the end, and if that were the case, business would carry on as per normal. It was disappointing, sure, but that's just the way these things go. I know Dan was really bummed about it. By the time the sale was announced, I'd already begun editing Murphy and Jake's entries and had started editing my own ones to suit the final direction of the book. I can't recall the exact number of entries or the completion percentage, but a lot of work had been sunk into making sure the info was right for the characters that made the final cut. TMNTE: Thanks again for taking the time to share your experience on the project with us! Jones: No, thank you dude! It's great to be back in the swing of things Turtle-wise. And don't forget to pick-up Tristan Jones's all-new Ghostbusters on-going series from IDW Publishing this September! It looks pretty sweet!